Marred by protests, the weekend vote hardly signals the end of Thailand’s troubles. Anti-government protesters were successful in disrupting Thailand’s elections on Sunday, with only 89 percent of polling stations operating without disruption. Polling booths in the south of the country, where anti-government sentiments are strongest, were the most affected. The Election Commission secretary-general Puchong Nutrawong stated after polling had finished that 333 out of 375 constituencies were able to conduct voting. Given the disruptions, the election results will not be known until further voting has taken place; at the earliest a result could be released by the EC after February 23. The night before the election a fire-fight broke out as masked gunmen shot at anti-government protesters, injuring seven people. The ongoing crisis, which began several months ago, has been bloody. It has thus far left ten dead and 577 injured, while it continues to batter the economy. On Sunday, some 130,000 security personnel were deployed nationwide, including 12,000 in Bangkok, to protect polling stations. In the tense environment, security forces stood as buffers between people trying to vote and anti-government protester’s blockades. Given the hostile environment and quick call of the election, there has been little campaigning by local candidates. As such, the vote became more about allegiances than issues. As argued here, if the deadlock is to be broken, issues not allegiance must be tackled. The caretaker government has been under severe pressure to come to some resolution. This pressure has come in large part from business, which has already endured more than three weeks of the Bangkok shutdown campaign. Confidence in Southeast Asia’s second biggest economy is faltering. The government slashed its GDP growth forecast from 5.1 percent (December 26) to 4 percent recently, while the director-general of the Fiscal Policy Office noted that if protests continue GDP growth in 2014 may be less than 2 percent. Political risk analysts have continued to downgrade the country’s stability for investment. This has been on the back of reports of the possibility of a coup d’état – which would be the country’s 19th attempted coup since democracy began in 1932 – and even the chance of civil war. Prime Minister Yingluck Shinawatra was no doubt losing support as her tenure continued. Last year, the ham-handed push of an amnesty bill that was to absolve her brother Thaksin of charges, was canned in the Senate with many pro-government senators also dismissing it. This year, on January 15 (at the height of the protests) the government failed to pay farmers the promised – and highly controversial – rice subsidy. As such, and amongst other criticisms, there is every reason to hold a vote and hold her government accountable for errors during her tenure. However, as protests become entrenched, so do allegiances. And those supporters that may have been turning from Yingluck’s Pheu Thai party have quickly fallen back to the party’s side. Indeed, it may have been that the Democrats would have won greater support, with even a possibility – albeit a slim one – of their first majority election win in two decades, had they contested the election properly. Instead, their decision to boycott the election has thrown Thailand’s long but pot-holed democratic tradition into what may well be its darkest hour. In 28 of the country’s 375 constituencies, candidates were unable to register after being blocked by protesters. Further elections will be held in those constituencies at a later date, but that could take months. This has been compounded by the fact that on January 26, some 440,000 of the 2.16 million people who had registered for early voting were prevented from doing so by protesters. The EC have promised that those blocked on this day will be able to cast their vote on February 23. According to calculations by The Economist, in the last election Pheu Thai’s “political strongholds” that won them the election and 48 percent of party votes only accounted for 38 percent of Thai GDP. By contrast, the Democrat’s strongholds, which won 35 percent of the party votes, accounted for 62 percent of Thai GDP. These figures from the last election in 2011 shed light on the current divide and perhaps the sense of entitlement that the two feel to power – one through wealth creation, the other through brute political force. Meanwhile, the military has to date been composed in its response. While General Prayuth Chan-ocha has continued to refuse to rule out intervention by the army if violence escalated, he has thus far shown restraint. The police have similarly appeared highly disciplined and structured. Much of the credit for this goes to their modern methods and training in non-violent policing, which has been aided by strong ties with the U.S., perhaps a lesson to other countries in the region. However, there is growing media coverage of disturbing rhetoric in the country’s northern capital, Chiang Mai. Government supporters in Chiang Mai, stirred in part by radio jockey Mahawan Kawang, have stated that they would welcome Shinawatra back to the city of her birth to set up a temporary capital to contest any coup or rival in Bangkok. That resistance could be supported with arms. Worryingly, the Thai-Myanmar trafficking routes, which have been so successful in transporting tons of opium and methamphetamine for decades, could also be used to transport weapons. The United Wa State Army, a 20,000-strong ethnic army nestled on the border with Thailand that controls much of these flows, also has the capacity to manufacture small arms. The Myanmar government has already stated its concern about the unrest in its eastern neighbor. An escalation of violence, as suggested by some in Chiang Mai, would be of great concern to Myanmar’s already fragile transformation. 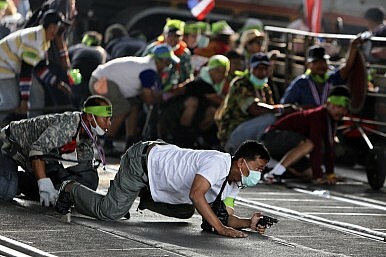 While talk of civil war is premature, the situation in Thailand could escalate quickly. The military may see it as necessary, if clashes become more violent, to step in and seize power – something it has attempted at least 18 times in the last 80 years. The much revered but aging King still holds the ace up the sleeve and could intervene to force negotiation. But whether he is willing to do so is another story. This move is further complicated by talk of a royal succession, which has brought into question the Crown Prince’s allegiances. Whatever transpires, the elections will not be, at least in the short-term, the panacea that many would have hoped for. The polarization will continue, and indeed, could grow worse. More violence, a coup, or even civil war, cannot be dismissed. Both parties must step back from the precipice and negotiate – this will only become harder as time goes on. Elliot Brennan is a Non-Resident Research Fellow at the Institute for Security and Development Policy (Sweden) and a Non-Resident WSD Handa Fellow at Pacific Forum–CSIS (USA). Thailand’s politics, yet again, takes an extra-parliamentary turn.